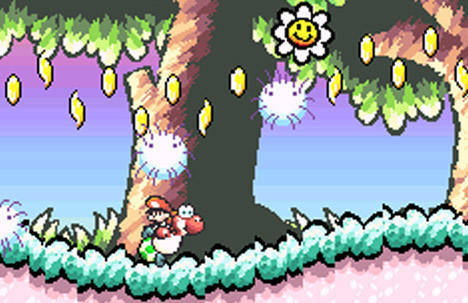 Yoshi’s Island was essentially a prequel to Super Mario World and introduced a new character to the Mario universe known as Baby Mario. Since then Baby Mario has starred in a few of his own games along side with his Baby Luigi counterpart. For Baby Mario, his story began in 1995 on the Super Nintendo. The story is pretty simple: Baby Mario is dropped from a stork onto an island inhabited by Yoshi’s. The Yoshi’s set out to find Mario’s brother Luigi who was been kidnapped by Baby Bowser. 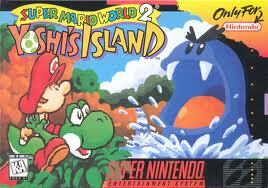 The game-play was completely revamped in this sequel to Super Mario World. Players take control of Yoshi with Mario on his back. If Yoshi is touched by enemies, Mario floats around in a bubble and cries incessantly until Yoshi retrieves him. You get a certain amount of time to get Mario back before you lose a life. There are collectibles throughout each level which tallies up a score to 100 at the end of a level. If you get 100 points on all levels in each world you unlock a bonus level to take on. Personally I’ve only gotten the bonus level for World 1 (go figure) because getting 100 points on each level is a tough feat. I’ve began playing again lately trying to get the lowest score possible for each level for grins and giggles. It’s been 17 years and I still play this game every year or so. It’s a classic in the Mario library and I would love to see a console remake of the game. 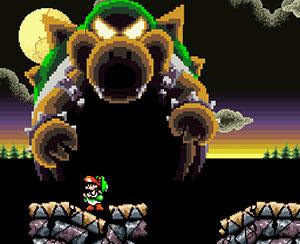 I’ve beaten the game a few times, and I remember fighting Baby Bowser for the first time and getting so scared of him (for some reason, I was a wuss when it came to games when I was younger) I had to wait a bit before I could play again. The sound track is awesome, and the level selection music is perfect. The source of my fears. Regardless, both iterations of the game are great, and you should play this game right now.